OTTAWA - Daniel Alfredsson spent a good chunk of his life in Ottawa. Now he has a key to the city. The former Senators captain was given the key Thursday night to recognize his outstanding accomplishments and contributions to professional hockey, his off-ice leadership and advocacy with the Ottawa Senators Foundation, the Royal Ottawa Foundation for Mental Health and the Boys and Girls Club of Ottawa. The 42-year-old spent 17 of his 18 NHL seasons with the Senators before signing with the Detroit Red Wings. Alfredsson officially retired this past December as a member of the Senators after signing a one-day contract. Alfredsson was moved by the city's offering and says he always enjoyed being an active member of the community. "It's humbling there's no question," he said. "I think I'll always underestimate the recognition I get in this city and the response I've been getting has been overwhelming at times. I'm very proud to be getting this recognition and I feel it's something I want to share with everybody that helped me to get it." Three months into retirement Alfredsson says he still has no immediate plans for the future and is enjoying spending time with his wife and four sons. While there are aspects of the game that he misses, he says he's enjoying having the opportunity to be more involved at home and helps out with his two oldest sons' hockey teams. Alfredsson hasn't ruled out a future in the game, but admits he's not prepared to step into any kind of role at this time. "(Hockey's) my education," he said. "That's what I have. I can't brag about too much besides that so I think it's something I'm going to be involved in somehow." Alfredsson feels he's not ready to commit his full attention to a new challenge at this point, but says that could change down the road. While Ottawa holds a special place in Alfredsson's heart no decision has been made in regards as to where the family will settle down, but he said a decision will likely be made following the end of the school year in order to ensure all four boys are settled prior to September to prepare for school and hockey tryouts. 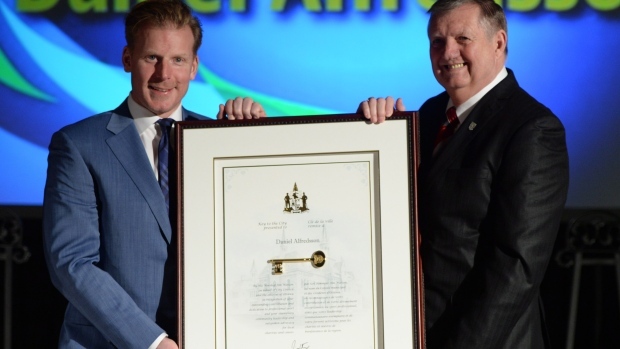 On Friday, Alfredsson will be presented with the Royal Ottawa's Inspiration Award as part of its 12th Annual Awards Gala for his work with a campaign to raise awareness for mental illness and the stigmas associated.